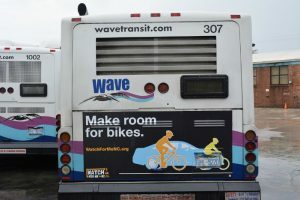 Photo: Watch for Me NC wrapper on WAVE transit bus in Wilmington. Located on the North Carolina coast, Wilmington has a population of 111,000, including 13,000 students at UNC-Wilmington. A popular tourist destination, many of Wilmington’s thousands of annual visitors choose to walk during their visits. Both the Chancellor’s Walk at UNC-Wilmington and the Downtown Riverwalk generate significant pedestrian traffic. The Watch for Me NC program in Wilmington seeks to improve conditions for bicyclists and pedestrians along these high-traffic corridors, creating a safer space for residents, students, and tourists. The Wilmington Metropolitan Planning Organization (WMPO) is the lead agency for New Hanover County’s Watch for Me NC program, but has worked with several other local organizations to implement education and enforcement events. These agencies and organizations include the cities of Wilmington, Carolina Beach, Wrightsville Beach, and Kure Beach; UNC-Wilmington and Cape Fear Community College; the local cycle club; the transit authority, Wave Transit, and the Wilmington Department of Public Safety. These partners balance a number of different Watch for Me NC tasks while the Wilmington and UNC-Wilmington police departments conduct enforcement activities. Increasing outreach and education surrounding schools is a priority for New Hanover County. Materials shared with local K-12 schools have been received positively. Both UNC-Wilmington and Cape Fear Community College have been instrumental in spreading the Watch for Me NC message at events and around their respective campuses. UNC-Wilmington promoted Watch for Me NC heavily to employees and students by distributing materials to students, faculty, and staff. Watch for Me NC logos appeared on all University vehicles, and the school distributed posters widely. Cape Fear Community College attached Watch for Me NC stickers to all garbage and recycling bins on campus. Wilmington has also increased awareness of pedestrian and bicycle safety issues through signage. Watch for Me NC advertisements are regularly displayed on public transportation vehicles in Wilmington. Through partnerships, Wilmington has been able to add Watch for Me NC materials to participant packets at running and cycling races. The city installed signage along cross-city trails, many of which cross several high traffic, high speed roadways, as drivers may not be looking for pedestrians or cyclists. This signage has helped alert users about intersections and that they should be alert for oncoming traffic. To reach a wider range of residents outside of these targeted activities, Wilmington and its partners have distributed Watch for Me NC educational and safety materials at several area events including National Night Out, UNC-Wilmington’s Beach Blast, the City of Wilmington’s Employee Health Fair, Park(ing) Day, Wilmington Riverfest, and bicycle and pedestrian advocacy group meetings. At a policy level, participation in Watch for Me NC has changed the approach to Wilmington’s transportation planning. Meetings with the Police Department to discuss progress are held monthly and staff are now using crash data to assess locations safety upgrades. City staff also worked closely with the regional planning organization to create a small area plan that seeks to address corridors with historically higher crash rates. Both City of Wilmington and UNC-Wilmington police departments conduct enforcement operations. Many enforcement operations take place at high pedestrian traffic areas and include a significant focus on education. In addition to issuing warnings about crosswalk use and adherence to crossing signals, police officers in Wilmington heavily distribute Watch for Me NC materials during enforcement operations. As a result of the campaign, the Wilmington Police Department is more aware and attuned to local bicycle and pedestrian safety issues. Benefits of the program are apparent to the community, who are actively engaged in the program. Residents provide feedback about where, when, and how Watch for Me NC related efforts can be most effective. For example, a parent reached out to express concerns about a specific school drop-off point. As an illustration of the program’s popularity, another parent inquired why no enforcement activities had occurred yet in her community. Start early: Implementing enforcement activities on campus at the beginning of the year sets a tone that will be easier to sustain, rather than encouraging safer behavior after poor habits have already formed. Meet regularly: The partners in Wilmington met weekly to track progress on different WFM activities and adjust their efforts as needed. Ease into enforcement: Rather than starting enforcement with citations, the Police Department first implemented education activities and issued warnings to those violating traffic laws. Later, when citations were issued, citizens better understood their violations and were more accepting of their fines. Convey shared responsibility: Safe roads require caution and respectful use by drivers, cyclists, and pedestrians. Illustrating how all modes contribute to safety (or danger) can generate more buy-in than identifying one group as the cause for concern. Thank you to Adrienne Harrington with the Wilmington Metropolitan Planning Organization for providing leadership, time and expertise to the Watch for Me NC Campaign and providing information in this profile.